Students usually look forward to the day before a snowstorm, eagerly putting their pajamas inside out or throwing ice out the window in hopes that these superstitious actions will result in enough snow to cancel school. Well, here at Trinity Hall, some students have not been putting their PJ’s inside out or throwing ice out the window. The reason for not wanting snow is simple: online snow days. Sophomore Lizzy C is up early to attend the 10th grade community meeting. Photo courtesy of Trinity Hall’s Facebook page. Some students agreed with Langille, claiming they were overloaded with snow day assignments plus homework for that night. “The teachers just gave us piles of homework. I stayed up until about 11:00 that night,” said freshman Haley Cesario. The traditional snow day gives students time off from their burdensome work; however, during these online school snow days, relaxation was not be found. 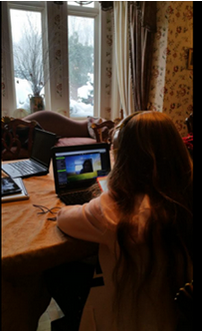 Freshman Dorothea Wotton felt the online school snow day put unnecessary stress on her that she could not handle. Although Trinity Hall’s online school snow days are intended to keep courses on schedule, for some students, they are filled with anxiety and difficulty. So how can these online school days be effective when most students dread them? March 31, 2015 in Archives.